SALT LAKE CITY – Out of the corner of his eye, junior forward Sam Dower caught a few seconds of the Kansas State-La Salle game on a wall-mounted television inside Gonzaga’s locker room. He took note of the score – Kansas State trailed big and would eventually lose 63-61 – and slowly shook his head. The West Region bracket, where Gonzaga is the top seed, has already seen No. 3 New Mexico, No. 4 Kansas State and No. 5 Wisconsin lose to lower seeds. With Gonzaga’s daily schedule, the Bulldogs haven’t been able to watch too many games on television. But word spreads quickly when one of the favorites goes on upset alert. “Even one of my boys, Mike Bruesewitz at Wisconsin, got beat,” Dower said. “We’re both Minnesota guys. We played against each other growing up and we’re really good friends. They got taken down by a 12-seed (Mississippi). 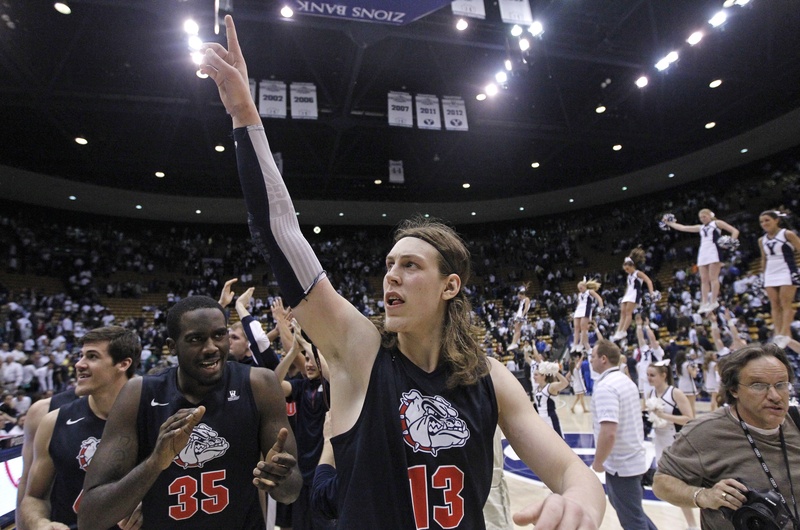 More and more, GU’s Kevin Pangos and Kelly Olynyk are seeing a familiar Canadian face on an opposing NCAA roster. Wichita State has Nick Wiggins, a 6-foot-6 junior guard from Toronto, and Chadrack Lufile, a 6-9 junior forward. Wichita State coach Gregg Marshall was the head coach at Winthrop when his team ran into Gonzaga in the 2005 NCAA tournament in Tucson. GU trailed by two at halftime but roared back for a 74-64 victory. Adam Morrison poured in 27 points to go with six rebounds and five assists. Ronny Turiaf and J.P. Batista combined for 27 points and 18 rebounds. It was Marshall’s last game at Winthrop. He accepted the Wichita State job, where he’s 109-61 in six seasons. In Carl Hall’s estimation, the only statistic that will tell more about tonight’s game than the final score is the final rebounding total. And that’s about what you would expect from a Wichita State player whose team prides itself on a tough-guy image forged through playing defense and attacking the glass. The Shockers outrebounded Pittsburgh 37-32 in a 73-55 victory on Thursday, and rank seventh in the country in rebounding margin, grabbing 38.4 boards per game. Gonzaga ranks just below them at 11th. The battle inside isn’t limited to the glass. Hall, who averages 7.1 rebounds per game and teams with 7-foot center Ehimen Orukpe to form a formidable starting frontcourt, stressed the importance of taking away clean scoring angles for GU’s Olynyk and Elias Harris.